How would you respond if someone asked you to describe the 1950s? Maybe you’d mention the Cold War between The United States and the Soviet Union? Elvis becoming more and more popular? The first satellites going into orbit? You could do that. Or you could explain how magazines advised women to seduce men. 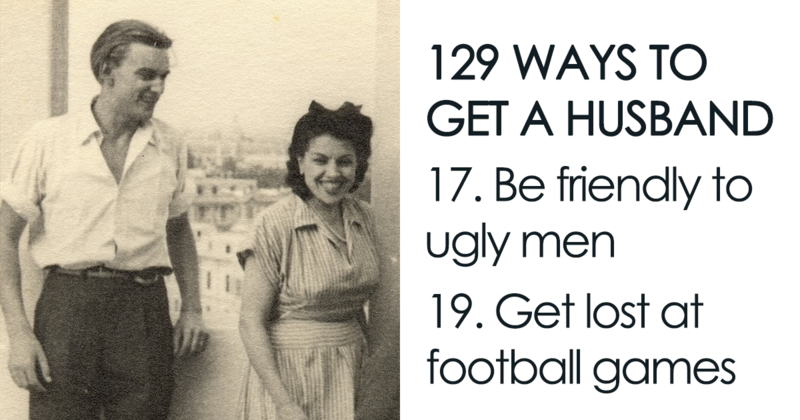 Recently, Kim Marx-Kuczynski from Madison, Wisconsin shared a 1958 McCall’s article, entitled “129 Ways to Get a Husband,” showing just how much times have changed. “In the United States today there are sixteen million women over the age of seventeen who are not married,” the text begins. “Presumably the vast majority of them would like to be.” The publisher asked 16 people to brainstorm strategies lonely women could use to get men to pay attention to them, and they delivered. From ordering rare steaks and no gossiping to crying in a corner of the room and getting a hunting license, some of these tips sound like common sense, and some seem to be… questionable. In their authors’ defense, the magazine did ask them to throw away their judgments when writing down their thoughts.